Google I/O is almost here and we're all waiting to see what's new from Mountain View. The tech giant has not given up on virtual reality and Google Assistant is improving all the time, which raises the question: why not integrate the two? It's only logical, after all. The Google I/O event is happening during May 8-10, just over a week from now. The big G has invited developers and enthusiasts to the Shoreline Amphitheater in Mountain View for a peek behind the curtain of what Google's vast ecosystem has in store for us. A scan of the schedule of events shows that Google is still working hard on VR and AR, which might surprise some followers of the company. After all, Daydream, Google's flagship VR platform, hasn't exactly been a resounding success, suffering from a lack of support from manufacturers. VR and AR: what's the difference? There are signs that Google is changing tack when it comes to VR though. The upcoming Lenovo Mirage Solo, a standalone Daydream VR headset, will soon be on shelves, ready to compete with the Oculus Go, Magic Leap and other standalone solutions arriving to market. But I'll tell you a Google project that definitely has been an unadulterated success: Google Assistant. Mountain View's magic helper has found its way to all our smartphones and has now settled into many of our homes, sitting in the Google Home or Google Home Mini speakers, listening, waiting to be summoned. "Ok Google, change scene to (location)"
"Ok Google, take me to (location)"
"Hey, Google, summon/give me/show me (object)"
And so on. Assistant could even be given its own avatar to personify the genie of the lamp. Although it might conjure up memories of the famous holodeck scenes of Star Trek, it's technology much closer to the reality of our time than warp travel. Google's next step into VR should be logical: integrate their excellent voice assistant into the standalone VR headset. Here's why Assistant could take VR to the next level. 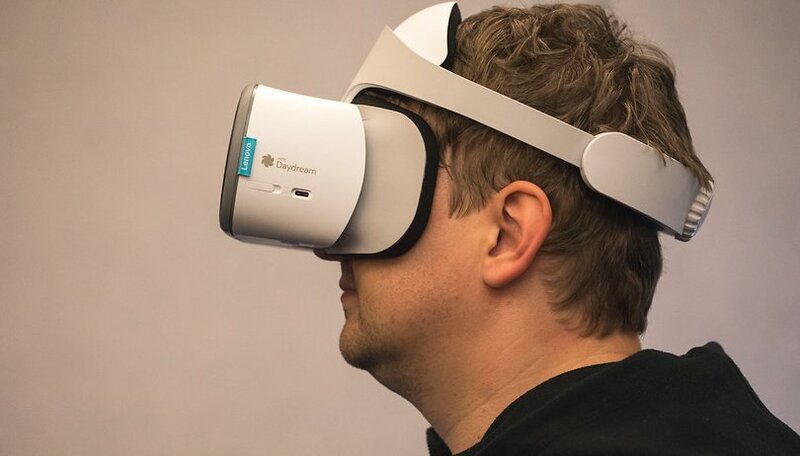 There are several hurdles that VR tech has to overcome before reaching the mainstream. One of them is certainly the awkwardness of navigating the total immersion of being in the virtual space. Currently this is handled via gaze direction (looking at a window or button in view for a few seconds to select it), or via a handheld controller, working kind of like a laser pointer/game controller. Both of these methods are often rather ungainly, but there's a more natural, effective way VR could be navigated—by speech. If Assistant can navigate the web and manage apps, there's no reason why this capability should be limited to the smartphone. It is already possible to use Assistant's voice commands to manage home appliances. Anyone who's taken the first tentative steps into low-to-mid-range VR (i.e., those who don't have an Oculus Rift or HTC Vive) has experienced all the little inconveniences that Google Assistant can solve. Voice commands could be used to search the web and navigate apps, and activate functions in virtual space, so you don't have to keep swiveling your head around. That's right, it could save you a literal and figurative pain in the neck. Sure, for immersive VR games where a quick trigger finger is needed to react faster than one speaks, handheld controllers will still have their place, just like on consoles. But for social and work applications in VR, there's no reason not to use voice control, and with Assistant, Google is well-placed to lead the way there. So, Google, if you're as serious about VR as the I/O timetable and Mirage Solo show, it's time for VR to be invited into the Google family: that ecosystem of apps and devices which are united by the presence of Google Assistant. Besides, who wouldn't want to be immersed in a virtual world where you manifest reality with your words, like a god? What do you think? Would a VR headset be more attractive with Google Assistant integrated? Good idea. It's obvious when you think about it. Even for dictation, you could combine dictation with a floating cursor, so you could 'stare' at a word and resay it to correct the text.